Generation Z – Are you ready for the arrival of the digital natives? You know them, those bright young people who simultaneously hold a mobile phone and surf an iPad whilst playing video games? Known as Generation Z (those born between 1995 and 2010), these digital natives are soon coming to a workplace near you. You may not realise it, but 2016 sees the dawn of a new workforce, as significant numbers of Generation Z graduate and start their search for work. With the economic situation ensuring people work for longer than ever, this will herald the start of four different generations co-existing in the workplace. Whether this is a happy co-existence is yet to be seen but far-sighted employers have their views set on understanding Generation Z and reviewing their readiness to engage with this group. Generation Z comprises nearly 2 billion people and within a decade will represent 20% of the global workforce2. 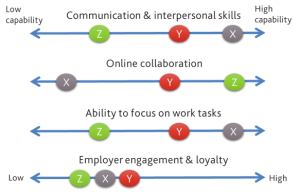 Many believe this change will give rise to some of the greatest challenges for employers in how they successfully integrate these smart, technologically intuitive employees with three other generations: Baby Boomers (born 1946 to the mid-1960s), Generation X (born 1965 to the early 1980s) and Generation Y (born 1982 to mid-1990s). Indeed, a survey in the US found that 65% of workers said that generational gaps were already making the job difficult3. This will require different human resource strategies and yet the profession appears to be relatively underprepared. So, with little research data available about Generation Z, how do their preferences differ from those of other generations and what will this mean for managers and HR professionals? Growing up with technology and social media at the centre of their social world, Generation Z has a breadth of networks envied by other generations. However, what started with Generation Y’s preference for text messaging and emojis, has developed in Generation Z into a reliance on technology which has changed the concept of social interaction at the expense of face-to-face communication and interpersonal skills. This places an unprecedented onus on Learning & Development departments and managers as mentors, to develop those skills to help Generation Z orally communicate and resolve potential conflicts. On the other hand, Generation Z’s ability to connect with others via technology could yield significant benefits. Globalisation has led to an increasing reliance on virtual teams, where Generation Z’s creativity in collaborating will be a crucial advantage. Management capabilities and attitudes may need readjusting to fully benefit from this collaboration. Generation X managers are likely to require encouragement to view this preference for “virtual” collaboration as an opportunity for innovation rather than a challenge to their control. Managers will also need to build high performing teams of multi-experienced generations and productively balance their differing aspirations. This will require them to truly embrace diversity and flex to bring out the best in very different individuals. Generation Z grew up moving from technology to technology, averaging between five screens at any time. As a result, they show unparalleled multi-tasking, quickly processing large amounts of information. This has led to shorter attention spans4 (think Snapchat and Instagram) and a quest for quick answers, over a capacity to think critically and accurately solve problems. Managers will be challenged to find ways to ensure a focused approach to delivery and to keep grasshopper minds actively engaged. Generation Y showed they were impatient for rapid career progression and saw their parent’s ‘organisational loyalty’ as not being rewarded. Expectations are that Generation Z will take a greater professional ‘freelancer’ approach to their careers – forecasts by social researcher Mark McCrindle expect them to average 17 jobs in a lifetime.2 This has significant consequences for onboarding and engagement strategies, as well as impacting the way in which work is delivered if Generation Z are to be developed and kept interested at the rate they want. Easy access to information feeds a desire by Generation Z to learn. A 70:20:10 development model might play to their craving to gain knowledge through interesting and rewarding work. A penchant for visual, snappy communication means that modular, technology-led training will be in demand over more traditional approaches. This may be a business challenge, as only 25% of HR professionals working with Generation Y rate themselves as ‘highly effective at enabling a strong self-learning culture’5. Generation Z’s aspirations when compared to previous generations may in time be unfairly judged as ‘decreased loyalty’. Their work ethic will ensure they get the job done – just in a different way. What is clear is that relations with this generation require a fundamental change in the rules of engagement. Organisations’ focus will need to change from retention to ‘renewable loyalty’ or intermittent interaction with a fluid talent pool. Traditional people performance measures, such as retention and satisfaction, will make way for output metrics such as delivery, impact and value creation. 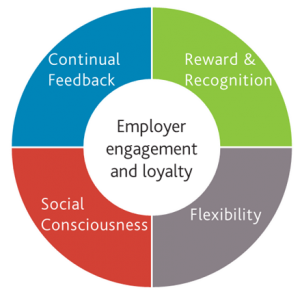 Employer loyalty and engagement is a multi-faceted issue with Generation Z’s preferences raising issues around how feedback is given, performance is recognised, workplace flexibility and how social justice is provided. The ability to immediately source information and solicit feedback from social media has contributed to Generation Z’s demand for constant feedback and affirmation. This need is likely to drive a move away from set timeframes for performance management. Leaders will need to coach, and to be good at it if they are to give Generation Z the regular, honest feedback and spontaneous recognition they yearn for.